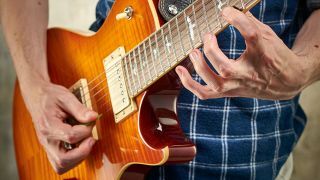 30-day guitar challenge: You may or may not want to be a shredder but you might still want to improve your playing speed so you can play the occasional burning lick. Every guitarist struggles with their playing speed at times because, of course, we have to start slowly with every piece of music we learn. Speeding up is just part of our learning process. And whether you’re into metal, blues, rock or folk this process is basically the same: check you’ve got your technique in shape, then practise slowly and gradually increase your speed as you play along to a metronome or drum loop. We’ve given you a couple of exercises to try out, but remember the idea is to apply all this to the music you want to learn. Use a one-finger-per-fret approach as a starting point for fast lead lines - your fingers should be roughly in line with the frets. You can stick to one string or transfer the exercise across the entire fretboard. Advanced players need to be comfortable with wide stretches. Less experienced players may need to build up to this. We’re using ‘first-second-fourth’ and ‘first-third-fourth’ fingerings here. Practise higher up the neck if the stretches are too tough. The best way to get up to speed is to play along with a metronome or a drum loop whose tempo can be adjusted (MIDI drum loops in Garageband for example). It doesn’t matter what kind of music you are trying to play - just follow these steps to get speedy. Choose a short, easy-to-repeat phrase and play it with your metronome or loop at a tempo where you’re making almost no mistakes. Practise the phrase to the click for 60 seconds. If 60 seconds is too long slow your click down a bit and try again. Increase the speed by 2 to 5bpm and play for another 60 seconds. It should barely feel any faster. Repeat step 3 over and over, getting faster by a few beats per minute with each 60-second play through. As you reach your speed limit and you start making mistakes, go back to your starting tempo - playing slowly should start to feel easier.